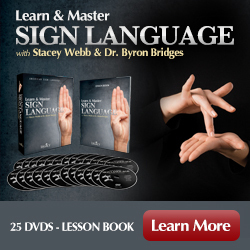 Learn & Master Sign Language course includes 25 DVDS with 49 plus hours of instruction. **Pricing is set by the Publisher of the product. Dr. Byron Bridges and Stacey Webb do not have control over this. However, please note if there are any questions about current pricing when you go to order please contact us, and we will be happy to assist with communication directly with the publisher. Once we know the set price we will post it. However, we did not want any discrepancies between the price here and there. We do know that the original price was $299 and they have dropped the price to $249 and have even run sales at $199. When you go to order it you will see the most current price, and again, we are happy to help in any way that we can. This product has been produced by Legacy Learning Systems out of Nashville, TN. CLICK PREVIEW TO SEE ! Hey I'm Stacey Webb and I'm a professional American Sign Language/ English Interpreter and Educator. I am excited to be working with my cohort and fellow instructor Dr. Byron Bridges. American Sign Language is a personal passion and I am very excited to teach it to you. We're here on set where will be instructing you on the receptive and expressive components of the language. We will start with the basics, introductions, gesturing, the alphabet, members of the family, and progress to advance techniques such as expansion features, classifiers, story telling and much more. We will also cover literally thousands of signs you can use in your every day life. We will be exploring how to communicate during emergencies, stories more. Learn And Master Sign Language is a comprehensive course to learn all about the art of this beautiful and expressive language. Do you have a family member who is Deaf or Hard of Hearing? Learn and Master Sign Language is perfect for all family members to learn the communication skills to create strong bonds within the family. Dinner table conversation is brought to a new level! Do you have a friend who is Deaf or Hard of Hearing? Is learning American Sign Language something that you have wanted to do to get to know your friend even better? When you learn the signs for the many different activities throughout this course you will be able to have more fun than ever on your adventures. Wherever you spend your day, you have the opportunity to interact with people who are Deaf or Hard of Hearing. Going through this course will teach you the conversational skills you need to make your customers, colleagues and neighbors feel right at home. Are you taking an American Sign Language Course in high school or college? If so this is the perfect supplemental material for you to work through as you work throughout your course. Stacey and Byron will help you bridge your learning gaps so that your language development can flourish. Are you the curious learner?? This is a self paced course that you can learn in the comfort of your own home! Take up a hobby and learn not just a new skill but a new language that will change your life forever!! !